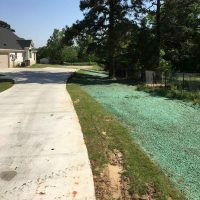 Hydroseeding, also known as hydromulching, is a fast, economical way to grow grass, and an effective tool for erosion control. We use high-quality wood fibers with grass seed to create an organic “blanket” ideally suited for seed germination. In most cases, you can expect growth within a week. We tell our clients to plan to be mowing within three weeks. In addition to traditional lawn space, this is an ideal solution for hillsides and sloped areas where erosion is a real concern. 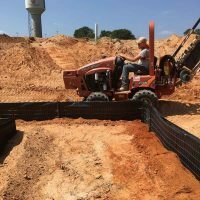 We understand one of the early needs in construction is turned soil coverage and erosion control. 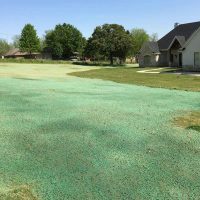 This is where hydroseeding comes in. We can help you establish quality turf quickly with our effective hydromulching. Our slurry of grass seed, mulch and fertilizer can be quickly sprayed down. When warranted, temporary irrigation is put in place to support seed growth. Adequate watering is critical to successful hydroseeding. In many cases, our clients will need temporary watering solutions while establishing their grass. Often, a short-term drip system can be tied into an existing grid. 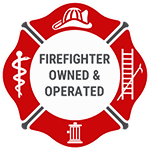 Sometimes temporary piping can be connected to a nearby fire hydrant with a dedicated water meter installed. If a local solution is not viable, Need Grass Now can assist with the rental of a watering truck service. 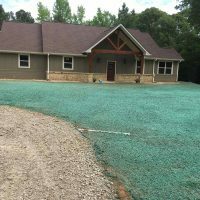 Quality grass can stop your erosion exposure, but we understand there will be times when turf building is not the answer, or when turf building is a latter phase in your project. For these reasons, we offer several other solutions to erosion control. For example, heavy-duty silt fencing is an option for low to medium flow areas. And, straw wattles can slow more concentrated water flow. A benefit to the straw wattle is that the organic materials can simply be spread out once the barrier need is no longer there. After assessing your particular site, we’ll make recommendations that make sense for you. Need Grass Now can assist contractors with erosion solutions compliant with the federal Clean Water Act. Give us a call today.